Recollections of Gaston Vignaud recorded in the cellar of Patisserie Bertaux on 13 July 1988. Gaston Vignaud served in the army during the war. 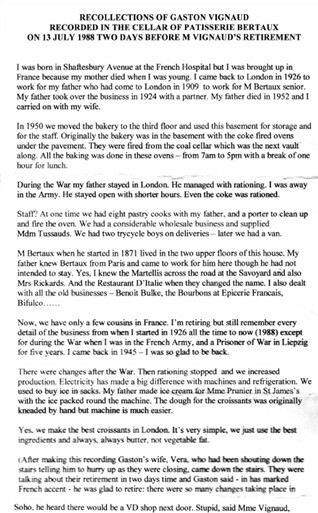 His family were based in Soho and continued to run the family patisserie during the war. Here he speaks about the difficulties of running a patisserie with rationing. This page was added by Camilla Bergman on 05/09/2010. Very interesting but is some of the PDF missing? There is only one page and it end mid-sentence. Dear Craig We will try and investigate what has happened to the missing pages on the pdf. They were created by a colleague who is currently out of the country so I will forward your comments to her and ask her to reply when she returns. M and Mme Vignaud (Gasto and Vera) were my next door neighbours in Finchley between 1965 and 1973, though I believe they remained in that house for any years afterwards. My sister occasionally worked in their patisserie around 1970 during school holidays, and they would sometimes bring us home a box of wonderful assorted pastries which were, to a young boy, heavenly. I would love to read the rest of M Vignauds recollections. I am Gaston and Vera's daughter and would very much like to see the missing second page. I had not seen this interview before today. Would it be possible to obtain the complete PDF? Thank you.